The Brewers season is over, and what a great run they had at the end. No one in Milwaukee or in the baseball world expected to be talking about the Brewers in the postseason back in the summer months of July and August. However, the Crew went on a tear in September to actually come extremely close to capturing a playoff bid as a Wild Card, but in the end, came up short. The Brewers finished the year 83-79, their 2nd consecutive winning season. So, with the offseason about 3 weeks away, I'm going to go over the changes that should happen, our predicted roster, and a few free agent signing that could happen. Obviously the main focus this offseason will be our pitching, much like how it was when we acquired Shaun Marcum and Zack Greinke 2 seasons ago. Both our rotation and bullpen need serious attention. First, the starting rotation. 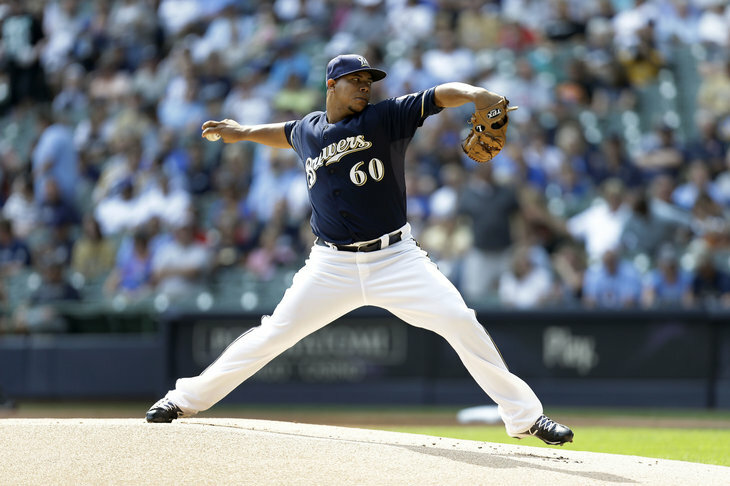 You have Yovani Gallardo as your number one, and then after that it gets complicated. There are many who question if Marcum will return or not, and my gut feeling is no and that he will be one of the things "addressed" in discussion by Doug Melvin, Ron Roenicke, and Gord Ash. So going further, after Gallardo you have candidates of Marco Estrada, Mike Fiers, Mark Rogers, Wily Peralta, and the returning Chris Narveson. For me, even though a month ago I was against it, I think Marco Estrada should be in our rotation. He proved himself this year and I'm all for it. To top out the rotation I would grab Mike Fiers and Mark Rogers. You can start Wily Peralta in Triple A and if he succeeds right away, then you have a solid back-up starter in case injury occurs. Chris Narveson might end up being the 5th man in the rotation, however I see us grabbing a free agent this offseason. Possibly a guy like Jake Peavy, Francisco Liriano, Edwin Jackson, or Paul Maholm could fit that role. One guy to watch to will be James Shields, who has a 9 million dollar club option or a 1.5 million dollar buy out. It's likely that he will resign with Tampa, but I hope our eyes are on some of these free agent pitchers, even if we have to spend some money. They will build our bullpen around John Axford (closer) and Jim Henderson (set-up). Brandon Kintzler and Jose Veras will likely be included in that mix of frequently used arms. Manny Parra will likely be our lefty out of the pen. Fransisco Rodriguez, Livan Hernandez, and Kameron Loe will likely be gone. If Narveson doesn't make the rotation, he could move to the pen as well. Two or three free agents will be brought in to get looks at during spring ball. Some top free agent relief pitchers that I would like the organization to look at consist of Brandon League, Jonathan Broxton, former Brewer Mike Adams, Juan Cruz, Chad Qualls, Sean Burnett, and Jeremy Affeldt. Mike Adams, Juan Cruz, and Sean Burnett have had pretty consistent statistics over the past five or so seasons, which is a good sign when looking at relief pitching. Qualls, League, and Broxton would probably require us spending more money then Doug Melvin wants, and Affeldt would only be looked at if Parra doesn't return next year, a decision management will have to make. Gamel will not start opening day unless 1.) Corey Hart gets hurt, 2.) Turns the Winter League in AZ upside down and puts up amazing stats, or 3.) Hart has to return to the OF cause of an injury to Aoki. Doug Melvin all but said in today's season ending press conference that Gamel will start the year on the bench. He will likely have Travis Ishikawa's role next year. Peralta showed us he can be a starter in the big leagues, but him getting injured just after 4 starts says that he is throwing way too hard. We will have to watch his innings next season and hopefully he progresses. Morgan just unfortunately doesn't find himself a spot anymore. Schafer is more than ready to be called up.